Blockchain technology and cryptocurrencies have become a prime target for forward-leaning hedge funds, venture capitalists, and private equity firms in 2018 as the crypto ecosystem rapidly matures. The total number of cryptocurrency funds has skyrocketed over the first half of 2018, surging to over 225 from just 58 at the end of 2017. While crypto funds may have experienced a rocky start to the year, with nine funds shutting down amidst a 48% nosedive in net returns across all cryptocurrency programs in the Barclays database, crypto funds have experienced a strong rebound with a 48% positive shift in April onwards. The rapidly evolving cryptocurrency market is gradually merging with the existing global financial system, with more complex financial instruments and products becoming available to market professionals. Related Story: First Regulated Ethereum Futures Launched In UK: How Will Futures Contracts Impact ETH Price? 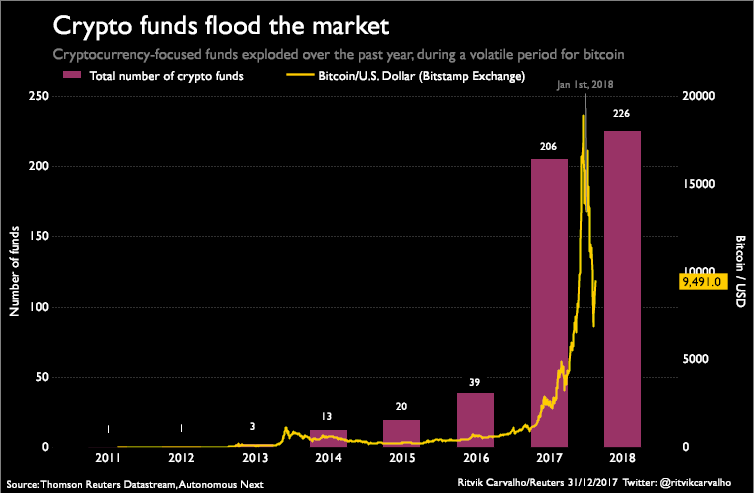 The first Bitcoin futures, launched in December 2017, catalyzed a surge of interest from traditional market participants, which has multiplied with the recent availability of Ethereum futures. The amount of tools available to market professionals within the crypto market, however, is still limited, leading to the creation of funds that unite the capital of both market newcomers and professionals. The highly volatile and lucrative nature of the crypto market led to the development of adaptive financial institutions that focus on the cryptocurrency market, such as crypto-specific funds. Data published by the Wall Street Journal demonstrates that average yields across 24 samples of crypto funds exceed 3,000%. Compared to the 8% return offered by traditional hedge funds, it’s easy to see why so many new funds are in the works. Where are Crypto Funds Investing? Data shared by fintech analysis firm Autonomous NEXT with CNBC demonstrates that crypto funds currently manage more than $5 billion in assets, contributing significantly to the entire blockchain ecosystem. Hedge funds account for roughly 65% of all cryptocurrency funds, with a further 32% driven by venture capital. Private equity firms hold just 3% of the total assets managed by crypto funds. Venture capital interest in the cryptocurrency sector has increased dramatically over the last year. The explosive growth of the initial coin offering model and the vast amounts of capital captured by token offerings caught the attention of venture capitalists, who are beginning to invest in the model at the pre-ICO stage. There are now hundreds of venture capital firms investing in promising blockchain platforms before token sales, investing in equity stakes before crowdsales in order to profit from proceeds later. In the first half of 2018, pre-ICO venture capital investment injected almost $500 million into the blockchain industry. The evolving requirements of ICO investors, who are beginning to seek more mature, established projects has led many blockchain platforms to raise equity in order to fund pre-ICO marketing and development. Interestingly, crypto funds that invest directly into promising blockchain platform appear to avoid index funds or value transfer driven tokens and gravitate toward projects that demonstrate a clear use case or innovative tech stack. 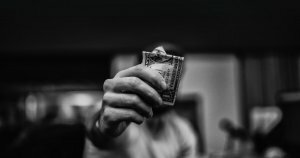 HyperChain, Kenetic Capital, Signum Capital, and Pantera Capital have all invested heavily in OmiseGo, with other projects such as Zilliqa, Ontology, ICON, Merculet, and 0x frequently invested in by crypto funds. While hedge funds investing directly into cryptocurrencies accounts for over 40% of all crypto funds, more than 25% of all funds target promising and innovative blockchain platforms, operating as classical venture investors. The development of hybridized blockchain incubator/accelerator programs such as those created by Huobi, IBM, and Blockchain Space proves that the ICO model hasn’t eliminated traditional venture capital — the advent of the ICO model has only forced them to adapt.